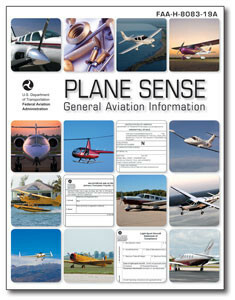 Published by the Federal Aviation Administration (FAA), Plane Sense introduces aircraft owners and operators, or prospective aircraft owners and operators, to basic information about acquiring, owning, operating, and maintaining a private aircraft. This handbook is a valuable reference tool for anyone who would like to review the “nuts and bolts” of general aviation, outlining the rules, regulations, and practical aspects of owning and operating your own airplane. This full-color manual covers subjects such as aircraft owner responsibilities, obtaining FAA publications and records, buying an aircraft, special flight permits, light-sport aircraft, aircraft maintenance, maintenance records, airworthiness directives (ADs), and the Service Difficulty program. Appendices provide comprehensive FAA contact information and a regulatory guidance index. Websites, sample forms, and checklists are used throughout, to provide additional resources and serve as quick reference tools. Pilots, Aviation Maintenance Technicians (AMTs) and Fixed Based Operators (FBOs) will find this FAA handbook a valuable resource. Plane Sense will help you make sense of all the paperwork associated with aircraft ownership and operations. Soft cover, 8-1/4" x 10-3/4", 96 pages.